I am not a J. Crew customer. Well, I used to be, back in the early 90s when the J. Crew catalogue still catered to college students and I was still wearing baggy sweaters and oversized men's t-shirts, but nowadays I find most of the brand's offerings too high-priced for my wallet and too trend-driven for my taste. It took perfume to get me through the door of a J. Crew boutique last week — specifically, J. Crew's collaboration with the niche brand Arquiste. No. 31 (my personal favorite of the two) is a sophisticated fruity-floral with notes of red vermouth, eau de vie accord, Bulgarian rose, damson plum, patchouli and oakmoss, "inspired by the bold perfumes worn by the artists. . . the essence and excitement of the avant-garde crowd." The roster for a "31 Women" was a formidable list, including Frida Kahlo, Dorothea Tanning, Louise Nevelson and Gypsy Rose Lee (yes, the burlesque entertainer! ), not to mention Peggy Guggenheim herself. It must have been a smart and eccentrically stylish gathering. Would the artists and their friends have been wearing spicy oriental perfumes and aldehydic florals, recent releases from Lanvin or Patou or Lucien LeLong? I like to imagine that someone must dabbed on Shocking or Snuff, since the designer Elsa Schiaparelli collaborated frequently with Surrealist artists, and many of the women featured in "31 Artists" were also Surrealists. You won't actually mistake J. Crew + Arquiste's No. 31 for a vintage fragrance, but I can see how it might allude to mid-century feminine perfumes. It opens with plum and some other ripe fruit notes that smell like currant and even a hint of blackberry, with a slight aldehydic kick. The fruits merge into a wine-y rose with the slightest hint of a "dirty" edge, and the fragrance's base is a soft chypre base of present-day patchouli and oakmoss (i.e., cleaned-up and a touch sweet). No. 31 has noticeable (but not excessive) sillage and good longevity for an Eau de Toilette, although the dry down is somewhat muted. After reading the list of notes, I was secretly hoping for No. 31 to feel like an updated interpretation of Rochas Femme (released in 1944, a year after "31 Women"), but it reminded me more of some recent takes on the plum-rose-chypre theme, like Les Parfums de Rosine Secrets de Rose or By Kilian Liaisons Dangereuses. Still, I like it very much, and I can see myself wearing it often once cooler temperatures arrive and I'm in the mood for a nicely balanced fruity-woody rose. No. 57, meanwhile, is inspired by the physical environment of Art of This Century, which was designed by the architect Frederick Kiesler. For one of the gallery's four rooms, Kiesler created a Surrealism-influenced space that looked like no other in the American art world: it had concave, wood-paneled walls and curvy multi-purpose furniture, and the paintings were mounted on the walls on projecting rods, so that they appeared to be floating in space.1 In a tribute to this wood-paneled space and the cocktails that could have been served there for festive events, No. 57 includes notes of aged whiskey, cinnamon bark, labdanum and vanilla. This scent is more gender-neutral than No. 31, and it could easily appeal to male as well as female J. Crew shoppers. It has a distinctly boozy note, close to real whiskey, that starts off intense and gradually mellows. This "cocktail" accord is lightened by a grassy note that reminds me of hay or broom. The cinnamon is warm and smooth (no red candies here!) and the woody notes suggest oak and perhaps some cedar, with something sandalwood-like hovering in the background. The vanilla in the base is smoky-sweet and makes me think of fragrances like L'Artisan Parfumeur Vanille Absolument (formerly Havana Vanille). Kevin recently noted that Arquiste's own The Architect's Club featured more vanilla than he expected; I don't find the vanilla in No. 57 to be dominant, although it's there in the mix. No. 57 and No. 31 both wind down more quietly than they began; that's how parties can be, of course — even avant-garde art openings. 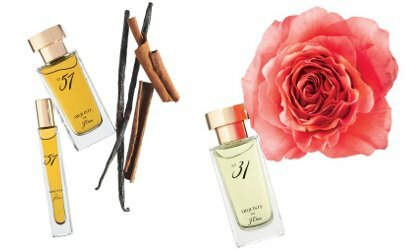 Both fragrances are well-made and wearable without being boring, and they're well-timed as autumn releases. You can't beat the price, either, especially for the roll-on travel size. (I bought one of each.) My only concern is J. Crew's pattern of "discovering" smaller brands and then quietly shuffling them off to the "sale" table in a season or two. I hope Nos. 31 and 57 will find their audience and stay around for a long time. For more information about this collaboration between J. Crew and Arquiste, visit here. You can listen to a short radio piece about Guggenheim and Art of This Century at the WNYC website. J. Crew + Arquiste No. 31 and No. 57 Eau de Toilette are available as 10 ml rollerballs ($25 each) and 50 ml atomizers ($78 each) at J. Crew stores and the J. Crew website. Pretty interested to try these; love small bottles though I wish they were sprays rather than rollerballs. Thanks for the reviews! I always prefer sprays, too — but I’m enjoying the rollerballs, and the fact that they cost the same as a rollerball of something from Juicy Couture or Marc Jacobs at Sephora is pretty wonderful! Totally! The one rollerball I have and really like is a manufacturer’s mini of Mona di Orio Musc, I think because a lot comes out and this scent lasts forever anyway. A good think about rollerballs is their ease of travel — No. 31 is hitting the town with me tonight. I tried both of these last week. Both ended up being a little too sweet on me, but I generally liked 57, or at least I liked the idea. They definitely did a great job capturing the whiskey smell accurately! I’d probably buy 57 if the little bottle were a spray instead of a rollerball, but as-is, I’m not sure it’s quite memorable *enough. * I bet this would be lovely in the fall, though. Maybe I’ll try it again when it gets a little cooler and I’d be more in the mood for it. I do think the timing is just right for these — they came out with the fall clothing! and I agree, the booze note is weirdly realistic. No. 57 might be a *little* sweet for diehard scent-obsessives, but I think it will seem more unusual and intriguing to the mainstream/J. Crew shopper. I hope they both do well! Terrific reviews of both fragrances! As you know, I really like both of these and have found myself wearing No. 57 quite a bit. The rollerballs are steals and the full bottles are so affordable too! I also like that both scents show how you can do really well-crafted fragrances that are distinct and interesting, and still keep them *gasp* very wearable and appealing to a lot of people. Hello there! I think I’ll be wearing No. 57 even more often once the temperatures drop a bit. It’s sort of sophisticated-cozy! I know, right? — J. Crew is actually assuming that its customers don’t necessarily want to smell cupcake-sweet or shower-fresh. Imagine? They might even go on to explore the rest of the Arquiste line or other niche fragrances! Chiming in to agree that I was really impressed with these. I’m not much for florals, so I was really surprised by how much I like No. 31- it’s so voluptuous! Thank you for reviewing these! I’m going to go try them again with your comments. I’m a huge J.Crew fan, love their stuff. The prices are amazing especially given the quality. I think the back story is fabulous too. As an art historian/perfume-lover, once I’d read the back story, I just *had* to sniff these and write about them. Really interesting! Ooh yay, so excited to see your review of these, Jessica! Totally agree about the quality, and the relative gendering of the scents. The one thing that smelled a little different on my skin was the sweetness–both to me and to the two kind friends who lent me their noses, 31 smelled a lot sweeter on me than did 57. Opinions split on whether this was an advantage–my male friend, also in his twenties, was with me in preferring 57, but college-aged sister liked 31. In any event, now happy owner of 57 in the 10ml! Sorry, male friend in his thirties as am I! Had to correct, what a nightmare to be catapulted back to my twenties Good riddance! Hah! I agree. 30s > 20s, all the way! Just picked up No. 57 and does anyone else think it resembles Kate Walsh’s Boyfriend fragrance a LOT? Down to the vanilla too! I love Boyfriend so not complaining but I just couldn’t help but note the similarities. Oooo, now I have to try it, too. My decant of Boyfriend was a bedtime go-to while it lasted. My Boyfriend sample vial is long gone, so I can’t do a side-by-side comparison, but they do have quite a few things in common! After wearing it for a few days, I have noticed that the No. 57 is much more dry than the boyfriend but they do share the woods and vanilla notes and Boyfriend ends up being a lot sweeter. They’re more distant cousins than sisters really But people that loved Boyfriend will LOVE the No. 57, so glad I picked it up! This will be getting a lot of wear from me this fall! Tried both today – they are both quite nice. I expected that I would like 31 more, but instead am more fond of 57, in part as it’s staying power is a lot better on me. I dabbed one roll of a roller ball on my wrist and it’s still quite noticeable 4 hours later. I will likely pick some up next time I am at J Crew! I’m so glad you liked them! I wore 31 again today, and got a compliment. I’m still impressed by this release!